Amazon is thought to be the retailer behind one of the biggest single pre-lets of 2018, which took place in December. 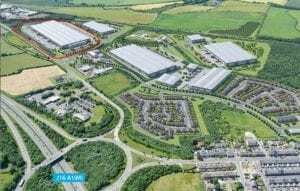 On Christmas Eve Tritax announced that it would be forward funding a 1.99 million sq ft pre-let at Citrus Group’s Integra 61 scheme in Durham, to the tune of £141.5 million with a ‘financially robust world leading retailer’. A trading update ahead of the publication of the Company’s results for the year ended 31 December 2018, released on Thursday 17th January 2019 linked Amazon with the both Integra 61 scheme as well as the dbsymmetry scheme in Darlington which was forward funded by Tritax to the tune of £120 million in May 2018. The development will comprise a new prime, state-of-the art, purpose-built facility, with a gross internal floor area of c.1,992,061 sq ft inclusive of three structural mezzanine floors and a low site cover of c.32 per cent. The high specification facility will be cross-docked with an eaves height of over 20 metres. The property will also benefit from significant capital investment by the occupier, including high levels of automation. The site has direct access onto Junction 61 of the A1(M) and is also easily accessible by air or rail, being located close to Durham Tees Valley Airport, Newcastle International Airport and Durham railway station. The location is also near to the ports of Tees, Hartlepool, Sunderland and Tyne. As well as its excellent connectivity the location was chosen because of ample supply of appropriately skilled and flexible labour within close proximity, which underpins the appeal of the area as an increasingly important UK distribution location. Upon practical completion, due in summer 2020, the occupier will take up a new 20-year lease, subject to five yearly upward only rent reviews indexed to the Consumer Prices Index (collared at 1 per cent per year and capped at 3 per cent per year). During the construction phase, the Company will receive an income return equivalent to the annual rent from the developer. This investment will be delivered in collaboration with the occupier and the Citrus Group, who will also be developing the remainder of the 200-acre Integra 61 project. DTRE represented the Company, CBRE represented the occupier and Avison Young represented the Citrus Group.